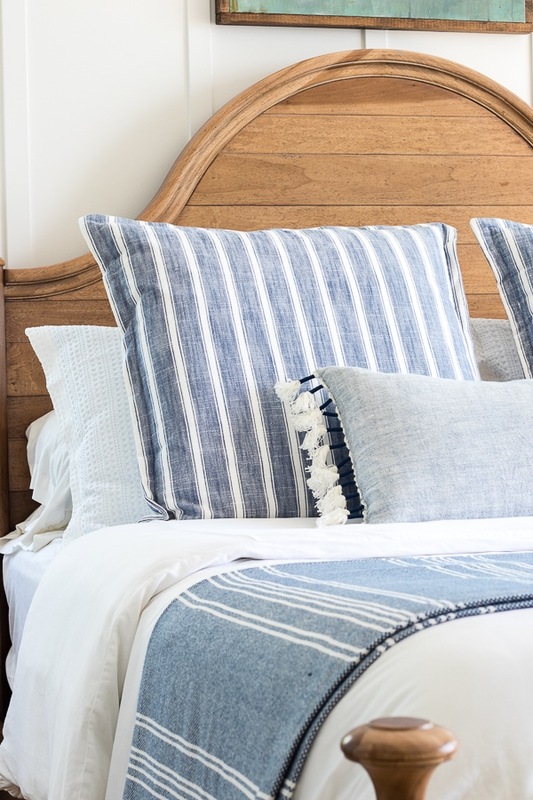 I think I’ve been talking about finding new lake house bedding for a few months now, and I finally found a winning combo! I wanted to go with a plain white duvet cover for the summer months, because a certain cute dog I know thinks this is his bed. He lounges here most of the day watching the boats out the windows and begrudgingly allows us to sleep in it with him at night. I know white plus dog usually equals disaster, but this is so easy to toss in the wash once a week and it comes out looking new every time. I picked up these pillows and the blanket at Target last month thinking they were heading for our couch, but I actually ended up loving them in here instead. I have been obsessed with this throw pillow from Serena and Lily forever, and I finally had to have it, I love how it finishes off the bed. Of course the downside of getting new bedding was my current rug no longer looked great, but it had had a good 3 year run, and it was time for a change. I landed on this jute rug from World Market and I love it. It added the perfect amount of texture and warmth in here. This is hands down my favorite jute rug I’ve ever owned, because it has a felt like type backing on it. This means it doesn’t budge, or shed and all that dirt that normally gathers under a jute rug doesn’t happen. Seriously such a genius design, I feel like it’s going to last so much longer that way too. I’m still loving our bench here at the foot of the bed. I’ve had a lot of you message me to see how it’s holding up and it’s still in great shape. Charlie thinks it’s his own personal set of stairs to his throne, because again it’s Charlie’s world and we are all just living in it. Once again, I need to point out my most favorite painting in our home from Melissa Lyons. If you haven’t checked out her art you can find it here, she is so talented. It feels nice, not scratchy at all. Hi jelly is your jute rug called Flynn from world market if you don’t mind me asking your house is beautiful ! 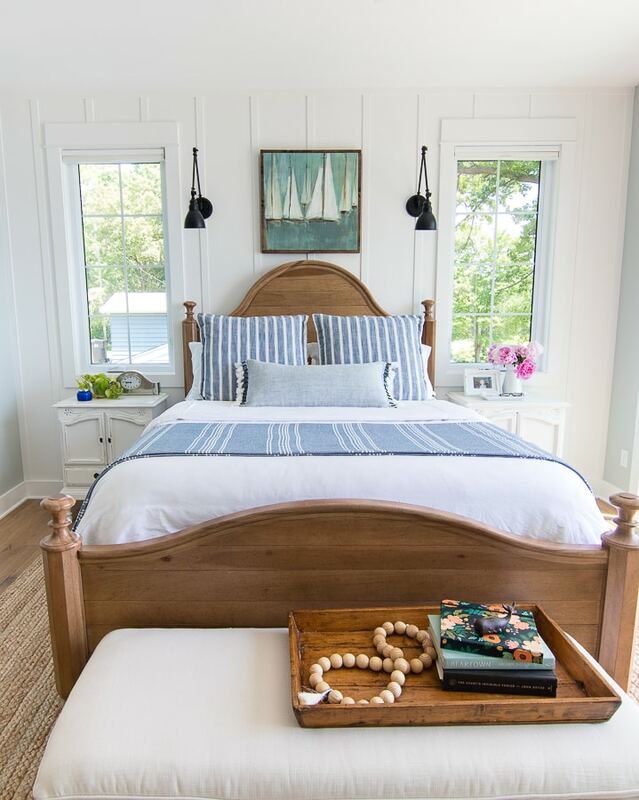 Gorgeous room and I’m sure Coastal Living will be knocking at your door soon….or they should be. All great choices, and I too love a good jute rug! This one is such a nice one! Hi Kelly, I’ve been following your blog for awhile now. Yours is the only one I check on a regular basis. Our tastes are so similar it’s uncanny. Except you really know how to do it, and I have to see how you do it to know that’s how I want to do it… :) So thank you so much! I’m getting ready to paint my basement this summer and I was noticing your bedroom paint color… Does silver strand have a touch of blue in it? The picture of the hallway down to your bathroom looks a little blue and a few that I just saw on Pinterest also look blueish. Of course I love the color blue! My main goal is to lighten everything up down there so I’m almost tempted to just go with a white… Thank you and enjoy making jam – I’m due to make tomorrow! Hi Lesley! Silver Strand is definitely a blueish silver grey color, it changes quite a bit with the light throughout the day. It’s such a pretty calming color! Love the refresh Kelly! Your home is gorgeous! Would you mind sharing some of your kids summer bucket list? We are trying to find new things to do this summer with our kiddos. Hey Andrea most of them are specific to stuff we like to do in the area but here are a few – strawberry picking, kayaking, hiking, outdoor movie night, camping in the backyard, make homemade ice cream, picnic, pool party, mini golf. Love this room as I do all of your other rooms. Simple, elegant, peaceful-perfect combos. Oh my your bedroom is pretty. I also love your posts. Can you tell me what size bed you have . Hi Jackie we have a queen bed. Love the pop of pink peonies! Hi Kelly, I have a question about rugs. I have used rugs in the past. They always leave a permanent mark on my floor when i take them up. Even with a non skid pad. We have built a new home and I would love to use a rug like in your post in my bedroom but I am scared it will mess up my floors. Any thoughts or suggestions? Thank You! Love your patio from your last post! The only permanent marks rugs have ever left are because the floors have faded from the sun is that what you mean? When we moved our last rug the floor was already darker under the rug after 1 year because of the sun fading the floors, but I know I will always have an 8 x 10 rug here so it doesn’t bother me. Thank you for your quick reply. You are probably right, the sun fading is probably what i am seeing. Take care! I just came across your blog through Pinterest. This room is gorgeous! Can you tell me about your flooring? We just bought a house and will be replacing the flooring. I love this color of wood! It’s perfect. That room looks so fresh and inviting! I have the same blanket from Target and love it. Can you tell me about the clock on the nightstand? I’ve been on the hunt for something pretty AND functional that glows softly at night but no luck. Hey Deb I have had this clock forever and I have no idea where I got it. It doesn’t work ha, but it’s so cute! Do you know the name of your bed? I looked on Wayfair and only found a similar one which was out of stock but I didn’t like it as well as yours anyway. I love the serenity of your room. Hi Jerri you just need to click on the link and it takes you right to the actual bed on Wayfair. All the words in bold are links to the pieces in this room, bonus it’s on sale right now! I am so in love with your bedroom. I am definitely a fan of neutrals, and your blues are subdued enough to make this gal happy! I really love the painting above your bed, I’ll look up your artist. I have a few jute rugs, they rarely show any dirt or wear and tear. Great choice. I have a lakehouse, too, and am always looking for inspiration! Great blog! Oh thanks so much Jane, yes, definitely check out Melissa! Hi Kelly, beautiful as always! I love your home, your decorating style and your family. Thank you for inspiring us all. Can you tell me where your bedroom ceiling fan is from? I have been searching for something like that for a while. I found the Jennifer Taylor arm chair but unable to locate the other 2 arm chairs with the rolled arms. Could you please let me know where they were purchased? Hey Tracy these were hand me downs from my mom that were custom made at a local store a few years back so I have similar ones linked but I don’t have an exact name to tell you – thanks! May I ask where you bought your sailboat wall art? Hi! You have such a beautiful home! Where did you get the painting over your bed? It’s from Melissa Lyons Art, check her out! I found your blog through Pinterest. I love the entire room~gorgeous! Where did you get your ceiling fan? 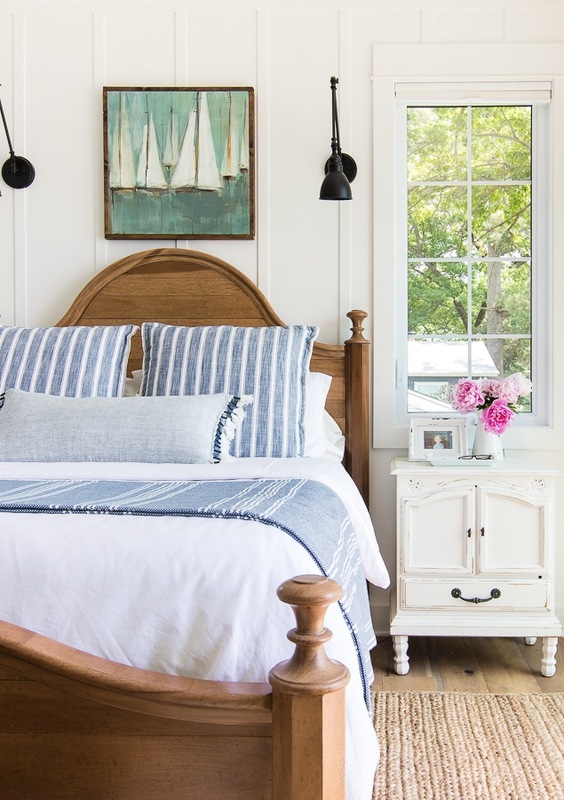 Just stumbled on your adorable lakeside bedroom redo – looks great! Would love an opportunity to chat with you about our coastal and lake specialized decor. 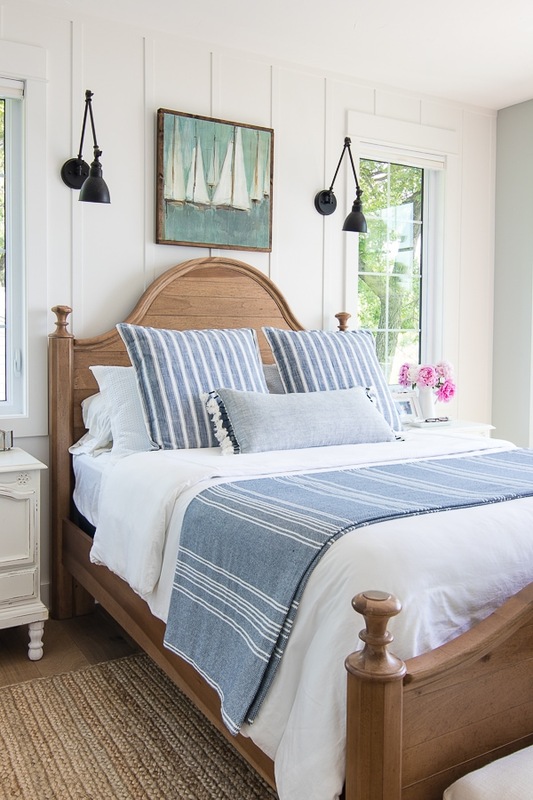 So glad I found you, will be pinning some of your ideas to our Coastal Decorating Boards! Thanks Caron, you can email me kelly@thelilypadcottage.com if you want to chat! Your bedroom is lovely! Can you tell me more about the bed? 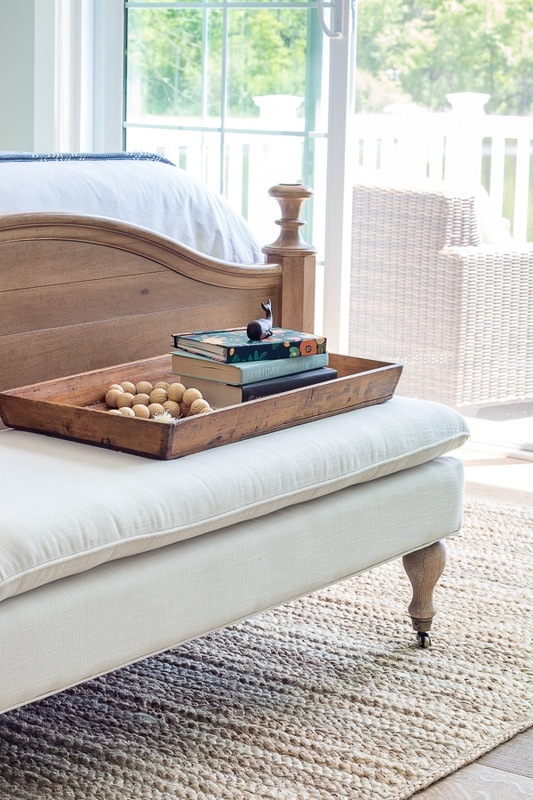 I tried the links but cannot find the exact bed. The color of the wood is very unique. It may be sold out right now, it’s been out of stock lately. It’s from Paula Deen’s furniture line you can try searching that on Wayfair.